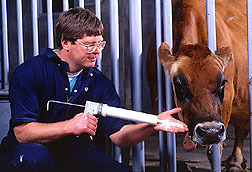 Veterinary medical officer Jesse Goff demonstrates the applicator for an ARS-patented gel that may cut milk fever in dairy cows by about 50 percent. The Agricultural Research Service has granted an exclusive license to Kemin Industries, Inc., of Des Moines, Iowa, for an ARS-patented gel that may cut milk fever in dairy cows by about 50 percent. Each year, about 500,000 U.S. dairy cows develop severe milk fever--usually within a day after giving birth. The disorder costs producers $150 million a year. According to ARS researchers, the gel may be given orally to cows when they give birth and for the first 2 days of lactation. Other oral formulations contain calcium chloride, which can irritate the cow's mucous membranes and the skin of the person administering the treatment. The ARS-formulated gel delivers calcium propionate, a less irritating form of calcium. Another advantage of calcium propionate is that cows can use it to make glucose for energy. All lactating dairy cows are energy deficient, because they use much glucose to make milk, and they can't eat enough immediately after calving to meet their energy needs. In ARS field trials with an Iowa Jersey dairy herd, the gel reduced milk fever from 50 percent in untreated cows to 29 percent in treated cows. Jesse P. Goff, ARS-USDA National Animal Disease Center, Ames, Iowa; phone (515) 239-8547. What's a natural way to kill insects in food processing plants? The answer has been around for 20 million years: diatomaceous earth (DE). But DE isn't earth--or even dirt. It's the broken-up shells of tiny plants, called diatoms, that lived in the sea roughly 20 million years ago. Today, these fossilized skeletons are being combined with heat treatment as an alternative to methyl bromide for controlling insects in flour mills and other food processing plants. "Turning up the heat creates one big oven for the insect pests. The heat breaks down the waxy layers of their exoskeletons, and the DE absorbs the layers, disrupting their internal water balance. Without this delicate balance of water, insects can't survive," says Agricultural Research Service entomologist Alan K. Dowdy. He's at the agency's U.S. Grain Marketing and Production Research Center in Manhattan, Kansas. In 1996 lab studies, Dowdy found that 98 percent of red flour beetles were killed when exposed to 122oF and DE. This insect is noted for tolerating heat under normal conditions. The study then became the springboard for a 1997 joint U.S.-Canadian field research project at Quaker Oats of Ontario, Canada. For the field test, the researchers placed confused flour beetles--one of the industry's worst insect invaders--in the processing facility. One hundred percent of the beetles died within a day after exposure to a temperature of 115oF and DE. The payoff for the food industry: Cost of heat treatment may be lower, and insect control is better using DE and heat, compared to using heat alone. Both Canadian and U.S. food processing plants have used heat treatments, but a few processors are concerned about expensive installation of new heating systems in older buildings. The researchers showed that lower temperatures could be used with DE and still control insects. Alan K. Dowdy, USDA-ARS U.S. Grain Marketing and Production Research Center, Manhattan, Kansas; phone (785) 776-2719. A new sprayer uses a light reflectance sensor to scan the ground for weeds, then kills them with less herbicide than conventional sprayers use. The eight-row hooded sprayer uses its sensor to distinguish differences in the light reflected from bare soil and from weeds between crop rows. If it "sees" a weed, it sprays it. The sprayer was developed for row crops through a cooperative research and development agreement with Patchen, Inc., of Los Gatos, California, and ARS scientists in Mississippi. Researchers tested the sprayer as part of the Mississippi Delta Management Systems Evaluation Area project. James E. Hanks, USDA-ARS Application and Production Technology Research Unit, Stoneville, Mississippi; phone (601) 686-5382. Taste buds as well as nutrition could benefit from future research to increase the health-enhancing com pounds in plant foods. The compounds are known as phytonutrients. It appears that many phytonutrients are produced as fruits and vegetables ripen to their delectable peaks of flavor. The dilemma: how to let ripening promote phytonutrients and yet retard postharvest softening that threatens quality. This question is one of the research areas suggested by nutrition, health, plant, and postharvest scientists from ARS, universities, and industry attending a recent ARS-sponsored workshop on "Food, Phytonutrients and Health." News about potential phytonutrient benefits of broccoli, garlic, tea, soybeans, tomatoes, and other foods has raised public awareness. But nutrition researchers need to determine which phytonutrients would make good targets for plant and postharvest scientists to increase and preserve. First, however, they need more sensitive tests to indicate small changes in risk for cardiovascular disease, cancer, or other maladies. Roger Lawson, ARS National Program Leader for Horticulture and Sugar, Beltsville, Maryland; phone (301) 504-5912. An ARS entomologist got the idea one day while blowing leaves in his yard at home: Why not turn the leaf blower into an insect collector? The result is the keep-it-simple sampler (KISS). An ARS engineer designed and assembled it to ease the long hours farmers and crop consultants spend counting insects in cotton, soybeans, and other row-crop fields, so they can estimate population trends of pest and beneficial insects. Usually they sample manually with nets or by looking at individual plants. But the KISS generates 150-mph winds that blow insects off plants into a net attached to the nozzle. ARS field tests showed KISS-ing is 10 times more efficient than hand-collecting boll weevils. It has been used to collect a variety of insects including pepper weevils, corn rootworm adults, and cotton fleahoppers. Most insects collected with the KISS are undamaged. Researchers believe it could be used by home gardeners to collect beneficial insects from wild host plants and transfer them to their gardens. Kenneth R. Beerwinkle, USDA-ARS Areawide Pest Management Research Unit, College Station, Texas; phone (409) 260-9519. Heavy metals--lead, copper, zinc, and others--in wastewater are a weighty problem for U.S. industries. Stringent environmental regulations require treatment of wastewater to remove heavy metals and other contaminants before it can be discharged into public waterways. This is expensive and time consuming for companies, and it drives up the cost of consumer goods. To alleviate this problem, Robert E. Wing and David J. Sessa, a team of chemists at the U.S. Department of Agriculture's National Center for Agricultural Utilization Research at Peoria, Illinois, found a way to use corn derivatives to remove the heavy metals. By chemically combining citric acid--a product of fermented cornstarch--with corn fiber, they formed a new compound that readily combines with heavy metals such as those found in industrial wastewater. The scientists hit on the citric acid derivative while investigating new ways to use corn gluten meal and distillers' dried grains, two co-products of ethanol processing that are now used in foods and livestock feeds. "Industry currently uses petroleum-based ion-exchange resins to remove toxic heavy metals from contaminated wastewater," says Wing. "With changes in environmental regulations, there is a need for biodegradable, renewable, and cost-effective products to treat this problem." The heat-modified citric acid contains fewer hydrogens in its basic chemical structure, making it more reactive. This causes it to bind with starch and protein in the corn products. Then, heavy metals that are attracted to the compound that forms can be easily filtered out of the wastewater. Sessa says that biodegradable ion-exchange agents like corn-based citric acid derivatives are a value-added market for dried distillers' grains and other corn processing co-products and represent a market niche waiting to be filled. "Corn-based citric acid derivatives are potentially less expensive for industry to use than nonrenewable petroleum-based products. They also create another market for corn growers," says Sessa. The Agricultural Research Service is seeking a licensing partner in industry to manufacture citric acid modified for industrial use. Robert E. Wing and David J. Sessa, USDA-ARS National Center for Agricultural Utilization Research, Peoria, Illinois; phone (309) 681-6353 or (309) 681-6351. "Science Update" was published in the July 1998 issue of Agricultural Research magazine. Click here to see this issue's table of contents.